Our last soup for Soup Month is another easy recipe. Just peel, brown, boil and puree’ for instant, creamy sophistication! In the pressure cooker, with the top off, over medium heat soften onions with the sage, salt and pepper. When the onions are soft, scoot onions aside and tumble in enough squash cubes to cover the base of the pressure cooker, let brown for for about 10 minutes stirring infrequently. 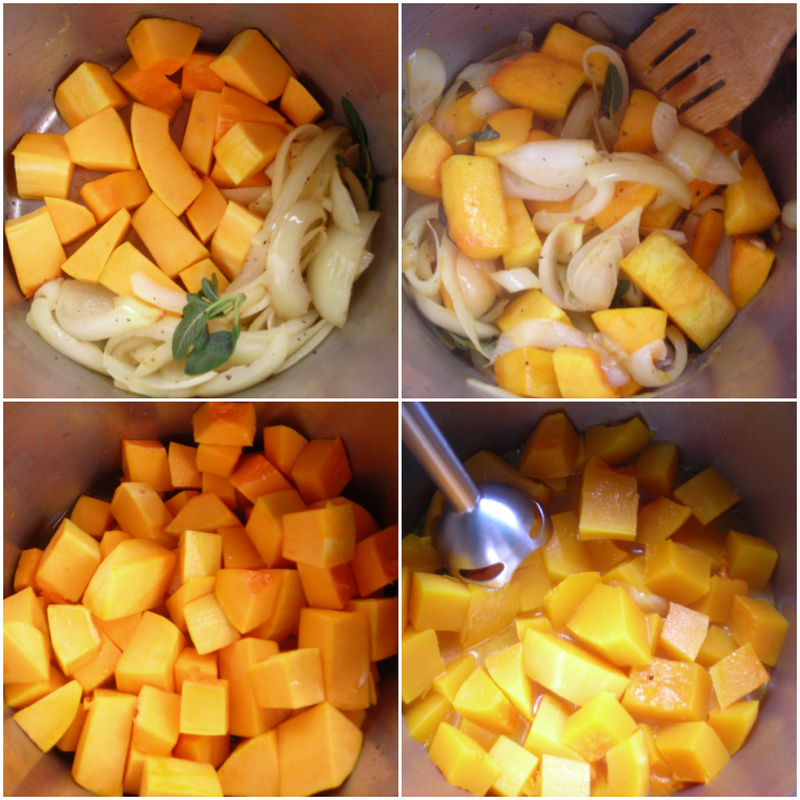 Add the rest of the squash along with the ginger, nutmeg, and stock. Stovetop pressure cookers: Turn the heat up to high and when the cooker indicates it has reached high pressure, lower to the heat to maintain it and begin counting 10 minutes pressure cooking time. Fish out the woody sage stem and discard. With a stick immersion blender puree' the contents of the pressure cooker and serve! Garnish with salty, toasted pumpkin seeds. In the process of making this soup (found on the iPot recipe book). I’ll fish the ginger out, hope that’s ok! Noemi, for vegetables it is safe to do the quick release. Actually, it is recommended!! I’m a bit confused. When do you use the olive oil? And do you remove only the stem of the sage, but leave in the leaves in when you blend? I also saw people commenting that they had problems finding the ginger to remove it, but the recipe doesn’t tell you to, so should I not just purée it along with everything else? Also, how do you add “salt and pepper to taste” at the first step? I know how to do that when I have something to taste (besides raw onion), but per the recipe, I have absolutely no starting point. Preheat the oil then soften the onions in it. I would personally add the ginger with the onions too. “Salt and pepper to taste” comes with practice. What you can do is add a bit, then taste the soup at the end before serving and add some more if needed. Make a note how much to add next time. Again, personally, I would puree the ginger along with everything else. Whether you remove just the sage stem is up to you. You remove it because the woody bit won’t puree very well. If there are still leaves attached I wouldn’t fuss about pulling them off. If I make this recipe again, I think I might change up a few things, like maybe brown the onions in smaller pieces, then separate from the squash, and add in after the rest has been puréed. To me, it felt like the soup needed a bit of something. What is the difference of high or low pressure in the butternut squash soup recipe? Which do you prefer? The goal of this recipe is to “melt” the veggie into a cream, so you’ll want to go with high pressure. If you used low pressure, instead, you’d need to double the recommended pressure cooking time to get the same result. You’ll want to use “low” or “no” pressure when you want veggies to still hold their shape – to steam broccoli, for example. I just followed the recipe on the Instant Pot recipe booklet & it didn’t turn out very well at all. I should have looked this up before I tried. Oh well at least I know now! I tried the recipe in the booklet as well. Looked like….well, I won’t tell you what it looked like but it was pretty bad. I thought perhaps they had switched the volumes for veggie and broth, and decided to get it directly from your website. They used cups instead of pounds. Two cups of squash is not a lot – Two kilos of squash is quite another matter. I should have realized right then that something was wrong. This recipe leaves many questions – when to add the oil? how should the ginger be prepared? how much squash (different than the ipot book). The instapot book also doesn’t let you know what level pressure. Glad I found it here. Also, in this recipe it says 15 min. In the instapot book it says 10. Waiting for the soup to be done now. I hope it’s correct . Fingers crossed. Insta Pot recipe book (4th edition) is wrong in multiple places. They say 5 minutes to brown the butternut squash (versus 10 above) and 10 minutes to pressure cook (versus 15 above). I think someone was trying to be clever to convert the recipe for some reason and they completely screwed it up. I’m currently trying again using this recipe. Much much better this time! If you want to add milk to a squash soup, especially one with ginger – try coconut milk. or even coconut cream.. So very yum!! a squirt of sriracha on top (each person can add their own to their bowl). Tasty Thai type soup. Just make sure to add any milk at the END of cooking and just stir in. Please; how many cups not pounds, in this recipe? I just made per instantpot and this receipe is too watery. Sandra, this version of the recipe in the Instant Pot booklet has the wrong amount. It should be enough cubes that come from a medium butternut. If you’re buying pre-cubed the package will have the weight on it. If I had to guess, a four-pound squash would be about 8 cups of cubes. watery broth. Such a waste of time–so glad I wasnt having it for company. I’m sorry about that. Instant Pot hasn’t done ANYTHING to inform their customers of THEIR mistake – and of course, it makes me look bad. I’m so sorry this happened. Just wanted to say thank you for yet another amazing recipe, I actually made this recipe using 2 kg bag of carrots, I also added more ginger as i love the ginger taste, and popped in two cloves of garlic at the end when ready to puree. I am fortunate enough to have sage growing wild in my garden so used the fresh new shoots to add to the onions so it wasn’t necessary to try and fish out woody pieces of stems before i began to puree. Hello. We just got the insta-pot yesterday and I’m attempting to make the butternut squash recipe. However, as a new user, I want to follow the directions exactly. But it would have been helpful to know what function to sauté the onions on (the recipe only says “over medium heat”) and when to add the olive oil. My husband assumed “sauté”. Obviously to sauté onions normally, I’d use some type of oil. But if you would be able in the future to include specifics in the recipe about which feature button to use, etc. it would be very helpful. It should still taste good. The recipe ingredients are favorites of mind. I have come back to this recipe many times. It’s just the best. I love the sage that’s added. I have used both fresh & dried at various times. One thing that has helped me on personal time, is cutting the squash in big chunks without peeling and pressure cooking for 8 minutes. After removing squash and water, I start sautéing the onions while I easily peel the squash. Then I put everything in the pot and pressure cook the rest of the way. My hands are not very strong and I find it hard to work with the tough skin of the squash. This way is so much easier. Thanks so much for your recipe! How do you cook on medium heat for 10 minutes with an instant pot? I knew to add oil and use the sauté function for softening the onion, but sauté kept turning off after 5 minutes and there wasn’t a way to adjust the temperature. I also didn’t have four pounds of butternut squash (that is a lot) so I’m thinking the vegetable broth (32 oz) is probably going to be too much. Still cooking. Susan, Instant Pot has three saute’ settings. So “medium” is usually their default saute’ setting. This recipe is pretty flexible so I have high hopes that it turned out well for you! You might want to check the accuracy of this recipe in the cookbook included with the Instant Pot. It states 2 cups pumpkin and looks like orange-colored water. However, I do like the seasonings. I’m just going to have to cook up the rest of the pumpkin the old-fashioned way and mix it together. Thanks Marie, Instant Pot did a TERRIBLE job of transcribing my recipes. Whenever one of my recipes there appeals to you, please come to check the hip website. I just got my Instant Pot and followed your recipe…with my modifications. I did not know there was a problem with the recipe. I substituted a tsp of dried sage and then added in some fresh thyme.I also added in a little more ginger. I added in about a cup more squash because it was left over, and left the ginger in when I pureed. It was absolutely delicious!!! I can’t wait to try more of your recipes. I am 100% in agreement with Kelly’s comment (Jan 2, 2018). This recipe printed in the Instant Pot recipe booklet is completely wrong! 2 cups of butternut squash – are you kidding? You make no mention of the olive oil and when that should go into the pot. I’m not using any of your recipes in this booklet. Your name is on this recipe and you’re responsible for it. Didn’t you proof read your own recipes before 100 million copies were made? It sounds like you’re irresponsible. I’m further going to notify and complain to Instant Pot about your recipes. Here it is February 2019 – the recipe is still incorrect and no mention of this anywhere. How sad.